December 11, 2012 - U.S. 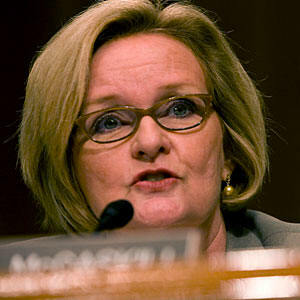 Senator Claire McCaskill today week wrote to the Federal Aviation Administration (FAA), urging the agency to allow expanded use of electronic devices during air travel as the FAA convenes a committee specifically designed to evaluate in-flight policies. "We live in an increasingly connected world, and information is traveling at the speed it takes our email to refresh," McCaskill said. "The current rules are inconvenient to travelers, don't make sense, and lack a scientific basis. Airline employees have the incredibly important job of keeping us safe in the air-their efforts are better spent worrying about rules that actually accomplish that goal." Current rules do not allow portable electronic devices (PEDs) to be used for the full duration of a flight. In McCaskill's letter to acting FAA chief Michael Huerta, she highlights the flaws in the existing rules by pointing out that the FAA acted earlier this year to allow airlines to replace their paper flight manuals in the cockpit with tablet computers. Other government officials, including Federal Communications Commission Chair Julius Genachowski, have also pushed the FAA to change their current rules regarding PED use. Noting that FAA rules have been too slow to change in the past, McCaskill's letter suggested that if the FAA does not act on this issue in a timely manner she is "prepared to pursue legislative solutions." As the Federal Aviation Administration (FAA) evaluates the in-flight use of portable electronic devices (PEDs), I urge the agency to embrace the expanded use of PEDs and work to revise the necessary regulations that will allow for the use of laptop computers, e-readers, smartphones and other PEDs during the full duration of a flight. The Aviation Rulemaking Committee (ARC) process that has been initiated by the FAA is an important step toward this end. Working with the airlines, electronic device makers and other stakeholders, I am confident the agency can craft policies that reflect the increasing use of these devices by air travelers for professional and personal uses, while maintaining a commitment to passenger safety. However, I am concerned by the longstanding intransigence in reaching workable, common sense solutions that provide for the expanded use by airline passengers of electronic devices during the full duration of a flight. I welcome Federal Communications Commission (FCC) Chairman Genachowski's recent letter in support of expanding permissible use of electronic devices on flights. The FAA must now come on board with this common sense position and enact new policies to memorialize it. As you surely know, the public is growing increasingly skeptical of prohibitions on the use of many electronic devices during the full duration of a flight, while at the same time using such devices in increasing numbers. For example, a traveler can read a paper copy of a newspaper throughout a flight, but is prohibited from reading the same newspaper for major portions of the flight when reading it on an e-reader. The fear of devices that operate on electricity is dated, at best. Importantly, such anachronistic policies undermine the public's confidence in the FAA, thereby increasing the likelihood that rules of real consequence will be given too little respect. The absurdity of the current situation was highlighted when the FAA acted earlier this year to allow tablet computers to replace paper flight manuals in the cockpit, further enhancing the public's skepticism about the current regulations. While safety and security must be the top priority in air travel, the FAA and other federal agencies should also work to ensure air travel is as hassle free as possible by revising or removing regulations that have become unnecessary or outdated. It is my hope that the FAA will work, with the FCC and other federal agencies where appropriate, as expeditiously as possible to implement common sense changes to today's restrictive regulations on in-flight use of PEDs that better reflect new technologies and the changing role these devices play in Americans' daily lives. While the agency can and should use existing authorities to allow for the broader use of PEDs, I am prepared to pursue legislative solutions should progress be made too slowly.